GUANTÁNAMO BAY, CUBA—Military prosecutors say they have tapes of telephone calls between the alleged mastermind of the Sept. 11 attacks, Khalid Sheikh Mohammed, and three of his accused co-conspirators talking in code about the plot months before it took place, a defence lawyer disclosed Monday. The lawyer, Jay Connell, revealed the existence of the tapes as part of a protest over plans to use them as evidence at the death-penalty trial of the alleged conspirators. More than 17 1/2 years after the attacks — in which 19 hijackers commandeered four commercial airplanes and crashed them into the World Trade Center, the Pentagon and a Pennsylvania field, killing nearly 3,000 people — there is still no date set for the trial in the proceedings at Guantánamo Bay. Prosecutors gave defence lawyers the original audio and transcripts of their translation on Sept. 30, 2016, Connell said, and made clear they planned to use them at trial. Defense lawyers sought to investigate their origins and later discovered that the original trial judge, Army Col. James L. Pohl, had issued a secret order preventing them from knowing about the phone call collection system or asking questions about it. Connell, who is representing Mohammed’s nephew, Ammar al-Baluchi, said prosecutors secretly obtained a ruling in August 2018 from Pohl forbidding defence lawyers from learning how the phone calls were collected or investigating that question. The phone calls in at least two languages were made between April and October 2001. Connell said the restriction on investigating the origins of the tapes violated a defendant’s basic right to challenge the evidence being used against him. He argued in court Monday that the evidence should be suppressed or that the case should be dismissed. He said the constraints the defence faces regarding the tapes violate the Sixth Amendment, which sets out the rights of defendants in a trial. The military trial judges have yet to decide, however, which aspects of the Constitution apply at the military commissions, the war court established by President George W. Bush after the terrorist attacks. A prosecutor, Clayton Trivett, responded that defence lawyers would be allowed to question an FBI linguist who compared samples of the voices of the defendants to the voices on the tapes to confirm they were Mohammed, al-Baluchi and two other alleged plotters. Trivett said defence lawyers would be allowed to question an FBI analyst who decoded the conversation. The only restriction, he said, is on defence lawyers trying to investigate “how the United States government got those calls,” something prosecutors convinced the judge would endanger national security. Trivett did not disclose how or when the FBI got voice samples of the accused plotters. Connell questioned in court whether they were recorded during the years Mohammed and the other the defendants were held in the CIA’s secret prison system. Trivett announced that the samples were not from the CIA black sites where the five alleged plotters were held before they were brought to Guantánamo for trial in 2006. This week a new military judge, Col. Keith Parrella of the Marines, is hearing lawyers and prosecutors argue in the 34th round of pretrial hearings since the five men were arraigned in 2012. 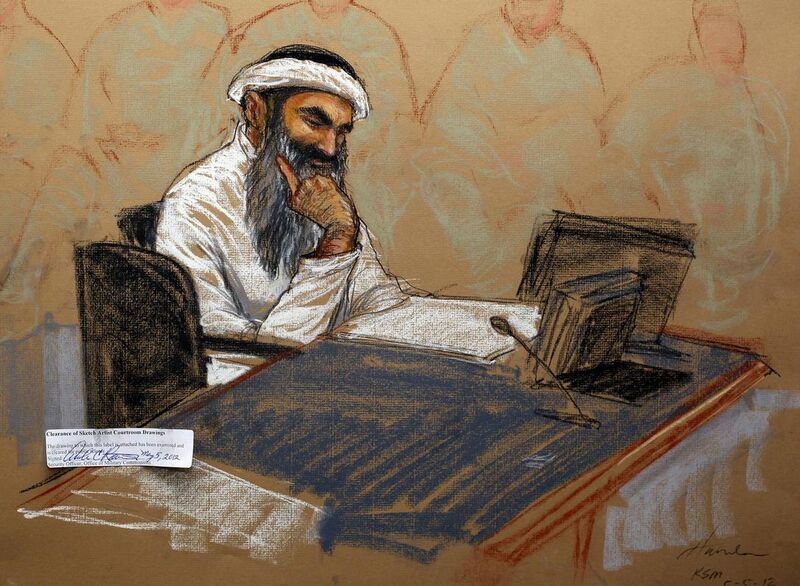 The tapes featuring Khalid Shaikh Mohammed and three of his accused co-conspirators were made between April and October 2001, prosecutors say. Are the prosecutors actually saying there exist tapes of calls made in April to October of 2001, but divulged to defense lawyers only in 2016, that reveal the attack planning that have been kept secret from us until now? And that the calls’ origins, methods of collecting them and chain of custody can’t be examined? One would have thought that the 9/11 Commission might have unearthed any 9/11 planning calls back in 2003 or 2004, when we family members were publicly pleading for this type of evidence. Why did it take until 2016 to mention the existence of these tapes? What was the National Security Agency doing with the tapes all this time? In what kind of code were the planners speaking? Will we ever get to hear the tapes or read the transcripts? We are in the 34th round of pretrial hearings and still no actual date has been set for the trial. Which parts of the Constitution apply? Maybe someone else besides us will finally take notice of these outrageous kangaroo court proceedings happening at Guantánamo. The writer’s husband, Kenneth Van Auken, was killed at the World Trade Center on 9/11. What The Hell Did The NSA Know About 9/11?